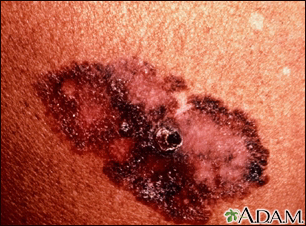 Malignant melanoma is the most dangerous type of the skin cancers. Typical features of melanomas include irregular borders, multiple colors within the lesion, rapid growth, and susceptibility to easy injury with bleeding. Any mole that exhibits any of these changes should be evaluated immediately by your health care provider.